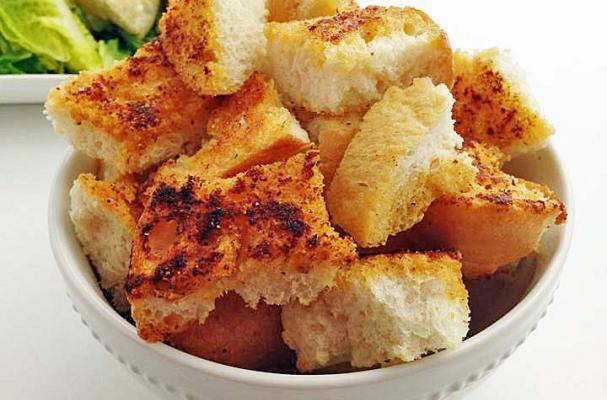 Croutons are by far one of the easiest accouterments you can prepare yourself. Foodista user Meagan Meyer submitted this recipe and we definitely think it is a winner. Cubes of toasted sourdough are flavored with butter and garlic to get the perfect balanced of savory flavor. Croutons can be sprinkled over of a pumpkin soup, tossed with a kale Caesar salad, or used as a topping for macaroni and cheese. Step 1: Preheat oven to 400 degrees Fahrenheit. Slice loaf of bread into 3/4 inch slices. Then slices those pieces into 4 pieces. And then each of those 4 pieces gets sliced in half. Step 2: In a small bowl, add butter. Melt in the microwave in 30 second intervals until completely melted. Add spices and mix. Step 3: Dip one side of each crouton into butter mixture. Place on baking sheet, in oven for 10 minutes, flipping halfway.